A self-made success in the rough-and-tumble world of Cincinnati politics, Garry Herrmann was the gregarious president of the Cincinnati Reds from 1902 to 1927 and chairman of the three-man National Commission that ruled major league baseball from 1903 to 1920. A flashy dresser who favored checked suits and pinky rings, Herrmann was a larger-than-life character who became known as “The Walking Delicatessen” for his habit of taking a supply of sausages with him wherever he went. While some owners disliked his business decisions, few disliked him personally. Noted for his generosity, Herrmann often began dinner meetings with a single table but would add seating over the course of the evening, refusing to turn people away. Finally, when the last course was devoured, Herrmann invariably picked up the check. August Herrmann was born in Cincinnati on May 3, 1859. Sometime in his early years he acquired the nickname “Garibaldi,” later shortened to “Garry.” His father died when he was 11 years old, forcing him to work stuffing salt sacks and running errands. Eventually Garry became a printer’s devil and started The Law Bulletin, the official newspaper of the courts of Hamilton County. A staunch Republican, he became a useful cog in Cincinnati’s corrupt political machine run by George “Boss” Cox. Herrmann served as clerk of the courts, member of the school board, and president of the Cincinnati Water Works Commission, charged with creating the Queen City’s new waterworks system. By the summer of 1902 he was important and wealthy enough to join Cox and the Fleischmann brothers, Julius (then mayor) and Max, as a minority participant in their purchase of the Reds from John T. Brush for $150,000. Never a baseball player himself—he preferred bowling, and later became president of the American Bowling Congress—Herrmann nonetheless was given the run of the baseball operations by his co-owners. Having sold the Reds, Brush put together $200,000 to buy the New York Giants from Andrew Freedman, who was so hated by the other NL owners that they footed a good part of the bill. 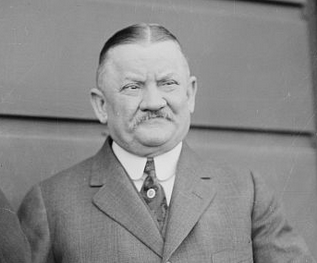 Freedman was solidly connected in New York politics, however, and his absence from the ownership ranks of the NL enabled the American League to find a site for a ballpark in Gotham. Herrmann, therefore, became a part-owner and president of an NL club while at the same time participating in a key solidifying event in the success of the AL—this during the bitter war raging between the two leagues. It was a typical Herrmann moment. He took care of business, saw to his own comfort, and enabled others to do well. In fact, the agreement of January 10, 1903, that ended the battle between the two leagues was known briefly as the “Cincinnati Peace Treaty” because of the role that Herrmann played by giving up his claim on the services of future Hall-of-Famer Sam Crawford to the AL’s Detroit Tigers. Better known now as the National Agreement, it established that the major leagues would be governed by a National Commission consisting of the presidents of the two leagues and a club president agreed to by both. For the duration of its existence, that meant AL boss Ban Johnson, whoever was leading the NL at the moment, and Herrmann. The Cincinnati president’s affability and instinct for compromise made him a natural choice, but some claimed that his willingness to agree with Johnson was what secured his position. Herrmann was responsible for some important and far-reaching compromises. For instance, he is sometimes called the “Father of the World Series,” and the title is deserved. Like the old World Series of the 1880s between teams of the NL and the American Association, the first modern World Series in 1903 was an exhibition arranged between the clubs. Thus, the Giants of Brush and John McGraw were within their rights when they refused to play the AL champs in 1904, calling the Junior Circuit a bush league undeserving of major-league status. Herrmann was instrumental in making the World Series an annual event with the official sanction of the National Commission, and it has been played essentially on that same basis since the 1905 World Series between the Giants and the Philadelphia Athletics. More successfully, Herrmann oversaw the construction of the ballpark that eventually became known as Crosley Field, the home of the Reds until 1970. The old Palace of the Fans was demolished after the 1911 season, and architect Harry Hake’s new ballpark was part of the Cox machine’s effort to make Cincinnati an exemplar of what historians call the “City Beautiful Movement.” The huge cost of constructing the new grandstand, coupled with poor attendance in the mid-teens, caused financial hardship for the Reds. Unable to meet its obligations and in danger of foreclosure, the Cincinnati Exhibition Company dissolved and a new corporation called the Cincinnati Base Ball Club Company was formed. Stockholders were asked to buy shares in the new corporation to raise capital and keep the club solvent, but the upheaval had little impact on Herrmann personally. He remained at the helm of the club as though nothing had happened. Herrmann faced his most serious opposition as chairman of the National Commission when NL president John Heydler refused to support his re-appointment just before the 1919 World Series. It was the best and worst of times for the Cincinnati president, whose Reds had just won their first NL pennant. Herrmann reveled in his role as host of the World Series, the game’s premier event. His generosity and appetite were on display for all to see, and he was ecstatic when the Reds finally won the World’s Championship and restored the glory that Cincinnati had enjoyed during the early days of professional baseball. Ironically, the subsequent revelation that the White Sox had thrown the Series was the final blow that brought down the National Commission. Herrmann resigned as chairman in January 1920 and his position was never filled. The Black Sox scandal forced owners to hire Kenesaw Mountain Landis as the game’s first commissioner. True to his character, Herrmann supported Landis’ appointment in the belief that it was the right thing for baseball in the long run. Herrmann continued as president of the Reds through the 1927 season, when poor health and increasing deafness forced him to resign and sell his shares in the club. He died on April 25, 1931, at the age of 71. His wife, Anna Becker, had passed away in 1916. The couple left behind one child, Lena Herrmann Finke. Note: A version of this biography appeared in Tom Simon, ed., Deadball Stars of the National League (Washington, D.C.: Brassey's Inc.: 2004).